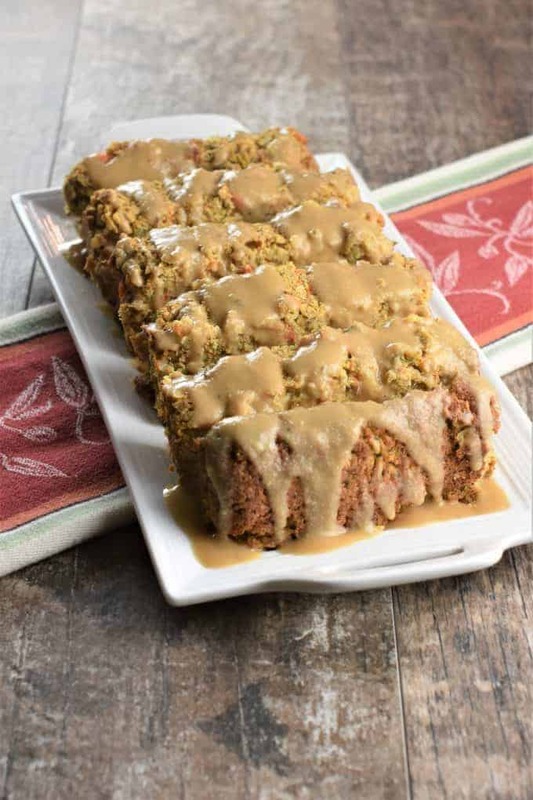 This Holiday Chickpea Veggie Loaf is packed with carrot, celery and onion and features the flavors of thyme and sage, making it the perfect meatless “meatloaf” for the holiday season. I seriously cannot believe that Thanksgiving is next week. Crazy, right? It feels like just yesterday it was still summer. And this year, not only will I be celebrating Thanksgiving next Thursday, but I will also be celebrating my birthday. It just happens to fall on Thanksgiving every few years. There’s nothing better than a birthday where you’re expected to eat all day! So, speaking of eating a lot, let’s get back to this vegan “meatloaf.” In addition to chickpeas as the base, this baby is packed with the traditional flavors of the Thanksgiving (and Christmas) holidays such as carrot, celery, onion, thyme and sage. Top it with our vegan and gluten-free Chickpea Flour Gravy and you have a winner of a holiday dinner! Preheat oven to 400° F. Make flax eggs and set aside. Heat olive oil over medium heat in a large skillet. Add chopped carrot, celery and onion and season with kosher salt. Cook on medium for 5-7 minutes until onion is translucent. Turn off heat and let stand for 1-2 minutes. Add chickpeas, thyme, sage, white pepper, kosher salt and the chopped veggie mixture to a food processor. Process on low or pulse until everything is well combined but not pureed, scraping down the sides as needed. Transfer chickpea mixture to a mixing bowl. Add flax eggs, vegetable broth, gluten-free bread crumbs and chickpea flour and use a spoon to mix in. Form the mixture into a loaf shape and press evenly into loaf pan greased with olive oil cooking spray. Bake for 45-50 minutes. Allow to cool for at least 10-15 minutes before serving. This Holiday Chickpea Veggie Loaf is packed with carrot, celery and onion and features the flavors of thyme and sage, making it the perfect meatless "meatloaf" for the holiday season. Spray loaf pan with olive oil cooking spray and set aside. Whisk ground flaxseed and water together with a fork and set aside. Heat olive oil over medium heat in a large skillet. Add chopped carrot, celery and onion and season with 1/4 teaspoon kosher salt. Cook on medium for 5-7 minutes until onion is translucent. Turn off heat and let stand for 1-2 minutes. Add chickpeas, thyme, sage, white pepper, 1/2 teaspoon kosher salt and the chopped veggie mixture to a food processor. Process on low or pulse until everything is well combined but not pureed, scraping down the sides as needed. Transfer chickpea mixture to a mixing bowl. Use a spoon to stir in flax eggs, vegetable broth, gluten-free bread crumbs and chickpea flour. Form the mixture into a loaf shape and press evenly into greased loaf pan. Bake for 45-50 minutes. Allow to cool for at least 10-15 minutes before serving. Please note that nutrition facts for this recipe were calculated without gravy or any other condiments. In addition, the nutrition calculator used did not make accommodations for low-sodium vegetable broth or no salt added chickpeas. That gravy, and that chickpea loaf….oh my. Will I miss meat? not at all! I’d be happy to eat this any day. Looks so delicious! Oh WOW! How delish does this look!!! I’ve never made a loaf like this…especially vegan and gluten free all in one! Looks amazing and I’m definately going to give it a try! I would have never thought to use chickpeas for a loaf! Thanks for sharing your recipe! This is such a great idea, it’s great to have a couple of veggie recipes under your sleeve for special occasions. This looks really good! I’m always looking for meat substitute recipes, and this is one I would definitely try! I love that you used chickpeas. I can’t wait to try this! Wow. What a treat to serve to my vegetarian friends at Christmas parties. Usually they bring their own protein…not this time! Thanks for sharing. I love chickpeas too find it so versatile! Such a hearty and healthy “meatloaf”. Love it !